Sumpner's test or back to back test on transformer is another method for determining transformer efficiency, voltage regulation and heating under loaded conditions. Short circuit and open circuit tests on transformer can give us parameters of equivalent circuit of transformer, but they can not help us in finding the heating information. Unlike O.C. and S.C. tests, actual loading is simulated in Sumpner's test. Thus the Sumpner's test give more accurate results of regulation and efficiency than O.C. and S.C. tests. 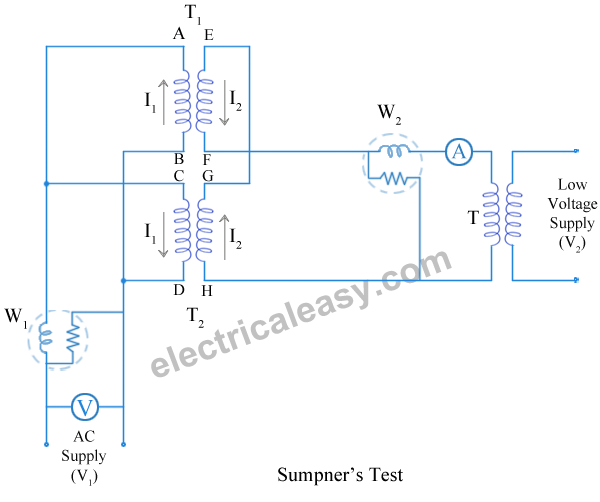 Sumpner's test or back to back test can be employed only when two identical transformers are available. Both transformers are connected to supply such that one transformer is loaded on another. Primaries of the two identical transformers are connected in parallel across a supply. Secondaries are connected in series such that emf's of them are opposite to each other. Another low voltage supply is connected in series with secondaries to get the readings, as shown in the circuit diagram shown below. In above diagram, T1 and T2 are identical transformers. Secondaries of them are connected in voltage opposition, i.e. EEF and EGH. Both the emf's cancel each other, as transformers are identical. In this case, as per superposition theorem, no current flows through secondary. And thus the no load test is simulated. The current drawn from V1 is 2I0, where I0 is equal to no load current of each transformer. Thus input power measured by wattmeter W1 is equal to iron losses of both transformers. i.e. iron loss per transformer Pi = W1/2. Now, a small voltage V2 is injected into secondary with the help of a low voltage transformer. The voltage V2 is adjusted so that, the rated current I2 flows through the secondary. In this case, both primaries and secondaries carry rated current. Thus short circuit test is simulated and wattmeter W2 shows total full load copper losses of both transformers. i.e. copper loss per transformer PCu = W2/2.